WFMC+ Archives - Annapolis Micro Systems, Inc. 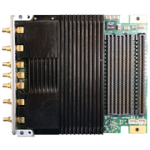 The programmable Sidekiq X2 and X4 from Epiq Solutions are multi-channel RF transceiver cards that introduce a new level of RF integration and capability, reducing product development times and improving wideband range, versatility, and performance. 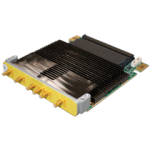 Sidekiq creates a flexible, high-capacity RF transceiver solution that is designed for pairing (as shown in photo) with a high-performance WILDSTAR FPGA Baseboard. This high performance WILD FMC+ TO00 Serial I/O Optical squeezes six FireFly™ optical transceivers on a single Mezzanine. Each transceiver runs up to 28Gbps. Compatible with any WILDSTAR mainboard with a WILD FMC+ slot. This high performance WILD FMC+ QA30 ADC has four input bandwidth options, internal sample clock options and internal 10MHz reference clock options. 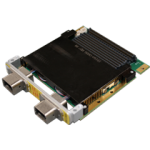 This card allows for eight ADC channels in one 6U OpenVPX slot (or four channels for 3U) when plugged into WILDSTAR OpenVPX FPGA mainboards. 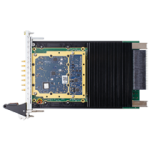 The WILD FMC+ QA30 ADC card also has optional speed grades up to 3GSps with a resolution of 14 Bits. This high density WILD FMC+ GM60 ADC & DAC is the industry’s first COTS FMC+ Mezzanine to feature the new Xilinx® Zynq® UltraScale+™ RF System-on-Chip (RFSoC) technology. The flexible RFSoC device can support many different configurations and combinations of ADCs and DACs. The GM60 is Annapolis’ first offering of the RFSoC, and provides 4 channels each of ADC and DAC. Contact Annapolis for other potential combinations. The GM60 is available for use with Annapolis’ WILDSTAR PCIe and OpenVPX Baseboards. Also designed for stand-alone use, the GM60 is designed for applications limited by Size, Weight, Power, and Cost (SWaP-C). This WILD FMC+ card operates within a tight envelope; it is slimmer than a 3U OpenVPX board, with about 45% less depth. 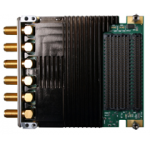 The versatile GM60 is ideal for advanced High Performance Computing (HPC), Radar, and Electronic Warfare (EW) applications, including DRFM, beamforming, sensor processing, wireless communication, and radar signal processing. This high performance WILD FMC+ 8A30 ADC has eight input bandwidth options, internal sample clock options and internal 10MHz reference clock options. This card allows for sixteen ADC channels in one 6U OpenVPX slot (or eight channels for 3U) when plugged into WILDSTAR OpenVPX FPGA mainboards. 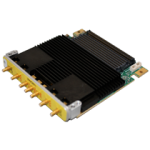 The WILD FMC+ 8A30 ADC card also has optional speed grades up to 3GSps with a resolution of 14 Bits. This high performance WILD FMC+ DM60 ADC & DAC has two input bandwidth options, internal sample clock options and internal 10MHz reference clock options. 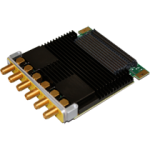 It allows for ADC and DAC speed grades up to 6GSps. The WILD FMC+ DM60 ADC & DAC also gives the user the ability to have up to eight ADC and four DAC channels in one 6U OpenVPX slot. This high performance Quad 500 MSps 16-Bit ADC WFMC+ has four input bandwidth options, internal sample clock options and internal 10MHz reference clock options. This rugged COTS mezzanine is optimized for high-performance operation in Wireless Communication, SATCOM Uplink/Downlink, RADAR, SIGINT, and EW. Compatible with any WILDSTAR mainboard with two WFMC+ slots. 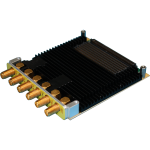 This high performance Quad 3.2/1.5 GSps 12-Bit DAC WFMC+ has two input bandwidth options, internal sample clock options and internal 10MHz reference clock options. 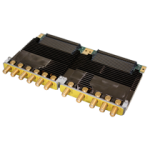 This high performance Dual 4.0/3.6/3.2 GSps 12-Bit ADC WFMC+ has two input bandwidth options, internal sample clock options and internal 10MHz reference clock options.